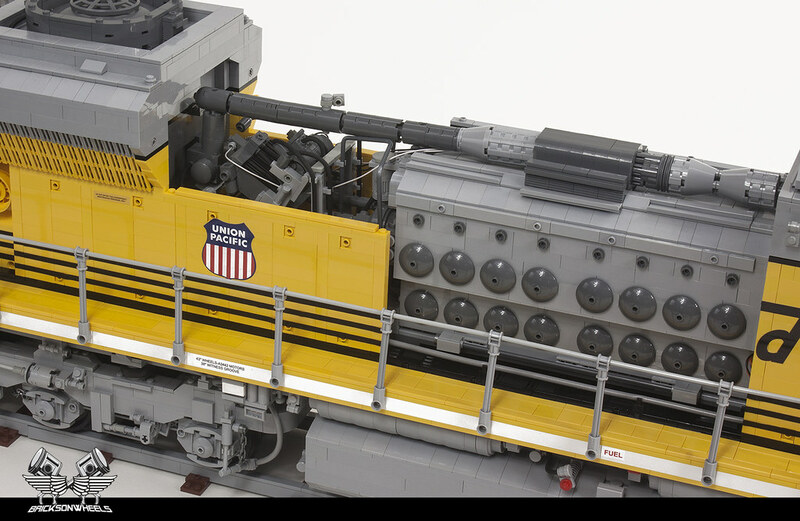 Two years ago I made my first locomotive as a full Lego scale model, set to the relatively big scale of 1/16. It was an older type American Diesel-electric unit called SD40-2, made by EMD (Electro Motive Diesel). The warm response the model received encouraged me to build another one, and this time I aimed for a more modern type, also produced by EMD: The SD70ACe. This mighty machine is a six-axle, 4300- horsepower, AC-traction diesel-electric locomotive which was first introduced in 2004, and has been in production since 2005. The SD70 ACe is very representative for locomotives used by North American Railroads to transport heavy freights. 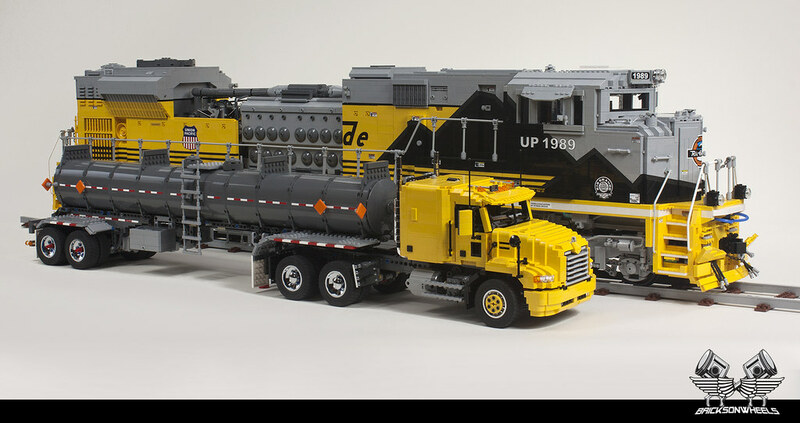 The locomotive that I replicated is owned by Union Pacific; a freight railroad that operates nearly 8,500 locomotives, from which about 700 are SD70 Ace’s, and is the largest in the United States. This specific example is something special though. It is a so called Union Pacific "heritage unit". These are a total of six SD70Ace’s which are painted in unique commemorative schemes which are meant to designate former railroads which Union Pacific purchased or operated over former trackage. 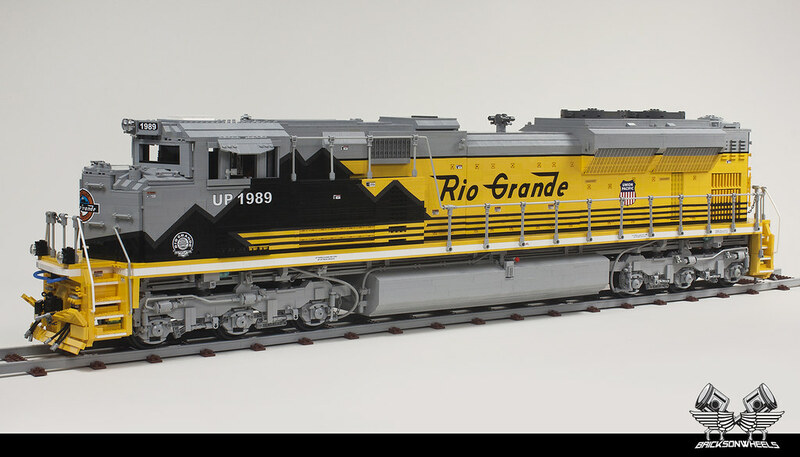 Locomotive ‘UP 1989’ is such a “Heritage Unit” and is exclusivly painted in the colors of “Denver and Rio Grande Western Railroad”, which Union Pacific acquired in 1996. The Lego model consist of about 27.000 bricks, and was built in 4 months. It is about 143 cm in length (56,2 inch). 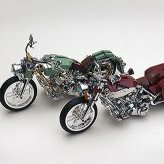 The model was made from pictures and drawings found on the internet. 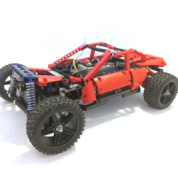 It is fully detailed both, in, -and outside with modeled engine, electrical cabinets and cabin. All decals were self-made as vector files, and printed and pre-cut at a professional company. Some retrofitted chromebricks are used. This is also the first time I have used lighting in a model. 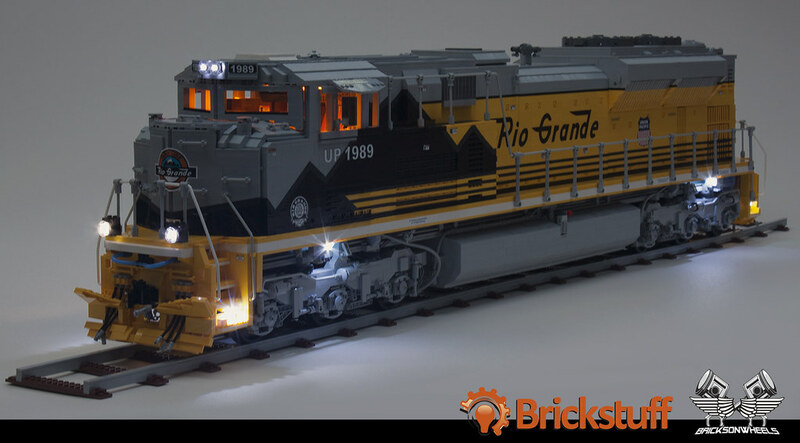 Rob from www.brickstuff.com made it possible for me to make a realistic lighting setup without sacrificing any space for detail due to the very thin wiring, and even the ditch effect is onboard. For the same detail space reason I used the small battery boxes inlcuding switches from Brickstuff, and there are now two main switches to operate the external and cabin lights. It really adds to the realism of a build, and it will definitly not be my last work with lights mounted! Yes, I do like it! This is an incredible achievement. I like very near Burlington Northern and see their locomotives every day, so I particularly appreciated your last model. This one is less familiar to me but the detail is fantastic. And the lights sure bring it to life even more! What did you use for wheels? How heavy is the model? Does it roll? Wow! Just Wow! 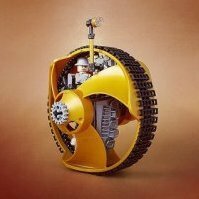 When I first saw this I thought that it was a non-Lego toy model. Wow, incredible... Fantastic detailing, work of art. If I may ask: did you ever consider making a steam locomotive at this scale? 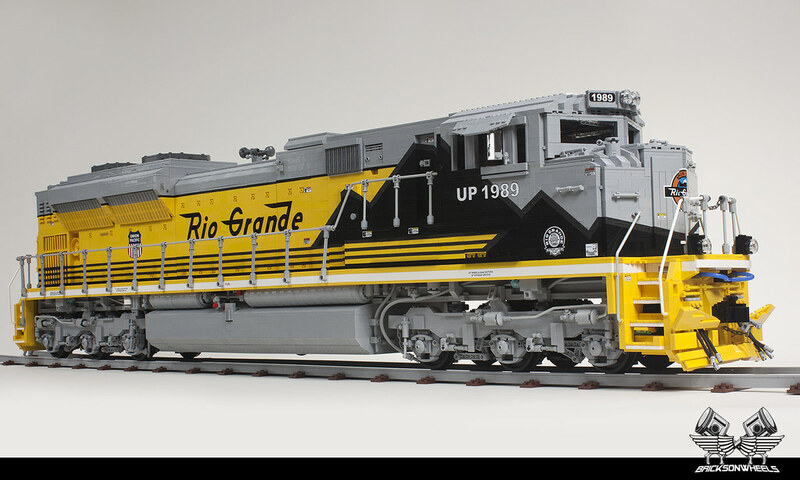 Wow, epic - I can picture this rolling across tracks in western Oklahoma heading to New Mexico (I have a vague recollection of seeing Rio Grand livery on trains in Oklahoma). The level of detail is fantastic. Question - do you do any modeling, in LDD for example, or just go with bricks from the start? edit: A quick search shows that Denver and Rio Grande Western never had trackage in Oklahoma - either I saw the trains running in New Mexico or Colorado, or the engines were in use by UP in Oklahoma prior to getting repainted. I just need to echo what everyone else here has said....that is absolutely incredible. 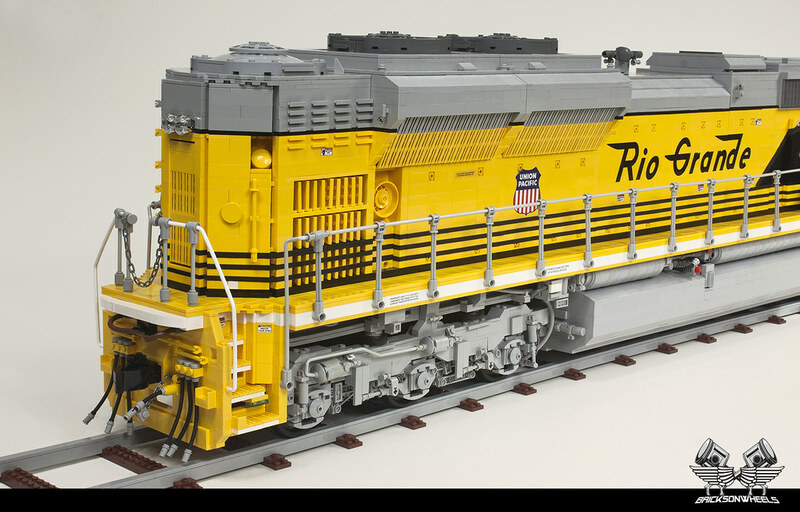 I myself also love HO scale trains but have never been into lego trains in their scale. This, however, is just uncanny. I would love to see you make a steam loco at this same scale! Why not a 4-8-8-4 Big Boy? Or how about an E8 Diesel? 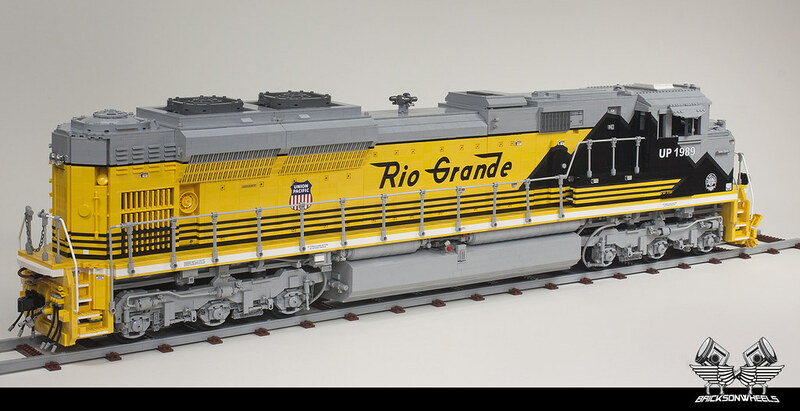 And Eric....good luck building this in BNSF colors! I can only see a train and a truck, where's the Lego models!? Wow! It is really impressive, all the details... I'm speechless!!! When I opened the topic and saw the pictures, scrolling down, more pictures, I was thinking "yeah, OK I got it now, how the original looks like..." Until I realized the pictures I was looking at in fact was of your Lego model! Now that is a lot of planning, work and detail. I especially like the lighting. Well done. OMG! Amazing masterpiece! It took me a little while to recognize that it is a model not the real one. Great work! I like all the details! This is a very beautiful model. The details are fantastic and great photography, too. 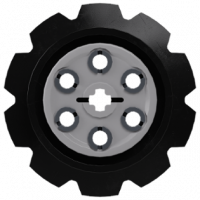 Did you machine the wheels yourself, or did you outsource that? like others, first thing I said when I saw it was OMG !! Sweet. Gives a new standard for Model Team. I was really looking forward to this from the WIP picture(s?) alone, and it sure doesn't disappoint! The level of detail that you are able to achieve is absolutely amazing. A joy to look at! I especially love all the detail you put into the trucks and fuel tank - amazing job! I am truly blown away. This is for one word...epic. I love the addition of all the fine details and SNOT work amazing job!